Last week, Young Harris College received the approval from the Southern Association of Colleges and Schools or SACS. This will take the college from nine baccalaureate programs to a total of 13 programs and three post-baccalaureate certification programs. According to Joe Anderson the Chair of the Math Department, YHC already has a four-year mathematics program but is anticipating approval from the Georgia Professional Standards Commission, PSC for the post-math education certification program. Six to seven YHC students on campus are interested in being math majors and hopefully in the next few years there will be as many as 20 to 30. Currently, there are three full-time faculty in the math department, one part-time and two adjunct professors; but over the next two years the college is working to hire two new full-time assistant professors. “We will help you get wherever you want to go, whether it is continuing to graduate school, teaching or starting a non-teaching career,” said Anderson. According to Anderson with the approval of the mathematics education certification program it will not only be beneficial to students but to the local community as well, because we will be producing teachers that can help with teacher shortages. Anderson went on to say that in the future the math department will expand to offer tutoring programs for local school systems. This will provide future teachers with exposure to working with middle and high school students. At this time YHC does not have any programs in the area mainly because the program is new, but students will have the ability to get out in the community. Over the Christmas break, Young Harris College became the owner of a nearby property across from campus. 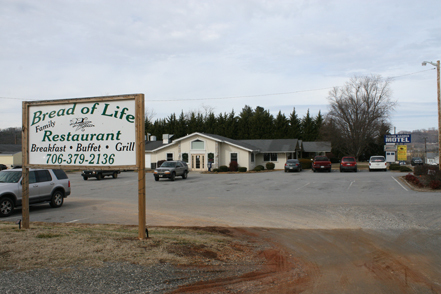 According to an e-mail from Young Harris President Cathy Cox, the property includes the Young Harris motel, the adjoining locally-owned restaurant The Bread of Life and the two-story building that was previously a real estate office. YHC has been discussing the purchase since last fall, when a local bank began procedures to foreclosure on the properties; but the foreclosure was not completed until December 31 of last year. According to Denise Cook, the director of Communications and Marketing at YHC, the purchase of this property is beneficial to YHC’s long-term plans for growth as a four-year college. The motel and office buildings are vacant, but the restaurant is still being operated by the Eller family from the city of Young Harris. 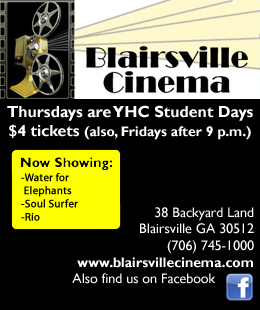 Although the YHC owns the land, their restaurant will remain open and the Eller family will operate it. YHC has made plans to improve the appearance of the restaurant by providing a new sign for the restaurant. In a META e-mail sent to all faculty over Christmas break, Cox mentioned that plans for the motel property have not been finalized, but many have been discussed. These include using the property as student housing, depending on if the enrollment rises higher than expected for the fall semester. If this option is finalized, then students could reside for a year in the motel if the enrollment exceeds expectations for next fall. “I would want to live in the motel, because even though it is just across the road it is more off campus,” said junior Mallory Holland from Woodstock. Other students like junior Ben Garner from Dahlonega mentioned that he would consider staying at the motel if the pool was available to students, since there was no longer a pool on campus. Despite outside appearances, Cox was quick to mention that the motel is “quite appealing” on the inside. Another alternative for the space applies to YHC faculty and staff. The college is expanding, and it will need additional office space for next fall. The motel has been discussed as a potential area for office space or academic programs. “We definitely will need more office space, if the plan to tear down the old recreational center goes through,” said Diane Bauman, an instructor of mathematics at YHC. According to Cook, YHC has considered using the two-story building as office space for the Bonner Leaders program and the Appalachian Studies program; however, no final plans have been made for any of these properties. Cox pointed out that this purchase did not include the buildings behind the two-story office building that are “falling into the ground.” Those buildings are still owned by the initial property owner. Also, the purchase does not include the rundown white buildings with broken windows at the intersection of Main and Murphy Street at the stop light behind the Brodi t-shirt business. That building was recently purchased by Barry Brown, the head cross country coach and owner of the Brodi. Every year on Martin Luther King Jr. Day students look forward to not going to school, some businesses close, and the working people enjoy a day off, but how much do students really know about the man behind this holiday? 100 students on campus at YHC were asked the question, “Do you know where Martin Luther King Jr’s famous speech ‘I Have a Dream’ took place.” The results of the survey revealed that 62 percent of YHC students knew the location of the speech, with the remaining 38 percent not knowing where the speech took place. Several students like freshman Jordan Meeks knew the location from watching the movie Forest Gump. 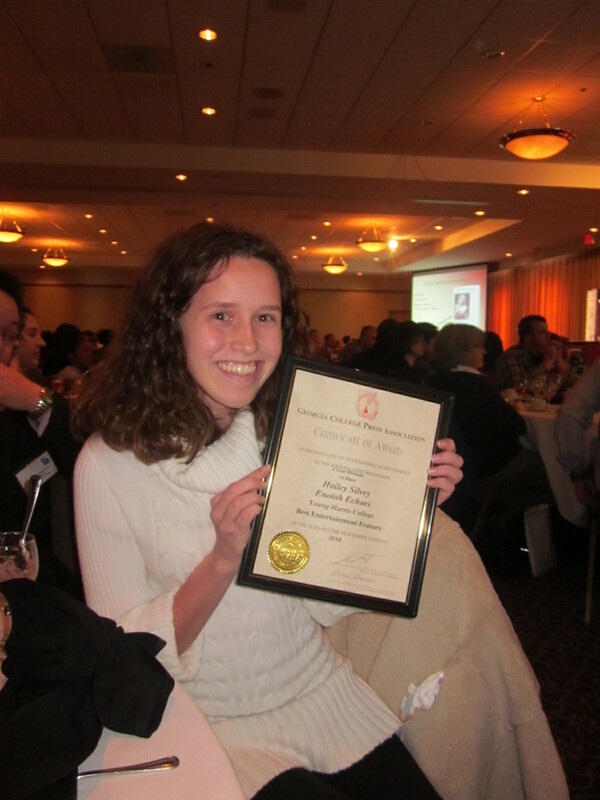 Other students like junior Stacy Kammer remember the location from learning about it in high school. The majority of the students who answered yes knew in detail the precise moment and location of the speech. This holiday is the celebration of the birth of Rev. Dr. Martin Luther King Jr. on Jan. 15, 1929. On this day we commemorate Rev. Dr. Martin Luther King Jr. for his great dream to unite this nation we live in through peace and understanding. His dream came true. Through his and other activists’ work, Americans of all colors are able to experience freedom; because of this, MLK day is an important holiday for all Americans. MLK Jr. was assassinated on April 4, 1968, and his grave has been turned into a national historic site in his hometown Atlanta. The 2011 celebration of this monumental day is celebrated on the 17th of January in all 50 states of American. The holiday is also celebrated in over 100 countries around the world. This year’s commemoration will mark the 82nd birthday of Rev. Dr. Martin Luther King Jr. and the 25th anniversary of its national honor. This holiday can now be found labeled on all purchased calendars, movies and books to this moment of history; however, people still remain unaware of the background of the speech that took place on this day. This day is recognized as a national holiday, but it has not always been that way. In November of 1983, President Reagan signed a bill initiating this day as a holiday in January 1986. During the time of the first celebration only Washington D.C. and 27 states honored this day. For example, it was not until 1992 that the state of Arizona recognized this day as a holiday. Arizona was not the only state to reject the holiday. Up until the year 2000 South Carolina was the last state that recognized MLK day as a paid holiday. It is on this day we honor Martin Luther King for his work toward nonviolent social change in not only America but across the world. Martin Luther King Jr. made history because of his shaping experiences in his hometown of Atlanta, his deep family origins in the African-American Baptist church, his theological studies, his involvement in religious and political leadership and because of his far-reaching contacts in the social justice movement during this time period. Each of these aspects led him to be the great and inspirational leader people know and appreciate still today. “Ever since kindergarten I have learned about Martin Luther King Jr.’s “I Have a Dream” speech and one of the things I learned was that it was given in the top section of steps in front of the Lincoln Memorial. That fact has always stuck in my mind,” said Junior Cody Craft. According to the MLK Online website, we must celebrate this day as “A Day on Not a Day Off” and commemorate King’s inspiring words, “We must work unceasingly to uplift this nation that we love to a higher destiny, to a higher plateau of compassion, to a more noble expression of humanness” -Dr Martin Luther King Jr.
A police report filed October 1 details the circumstances surrounding the arrest of one Delta Lambda member following a disturbance reported outside of the old YHC recreational center. In early October, three YHC students were caught by campus police lurking between Maxwell Math and Science Building and the old gynmasium dressed in black and in possession of set of campus master keys. The incident led to one arrest, the exposure of a secret campus society and a revisitation of campus policy regarding student access to keys. In the early hours of Friday, Oct. 1, students David McEwen and Tory Gravitt were wearing dark-colored clothing when they were approached by YHC police officer Tommy Shook. According to police reports, both students ran from Shook and were later found near the baseball fields by a deputy of Towns County Sheriff’s Office. McEwen and Gravitt were brought to the police station for questioning where they were joined by a third YHC student, Austin Freeman. All three claimed to be “exploring the campus” using a set of master keys that were provided to them through their membership in a secret organization called Delta Lambda, or “Down-Low.” McEwen was arrested, and the other two students were detained as additional suspects. Once questioned, the trio revealed that as members of Delta Lambda they would sneak around buildings late at night using Delta Lambda’s set of master keys. These keys were passed down year to year. The keys were originally obtained from founding members Cody Morgan and Alan Guilfoyle. After questioning, Freeman handed over the keys to YHC police as well as a backpack containing books with information on other campus organizations. According to Freeman, all three students were provided the opportunity to negotiate their punishment alongside YHC police and administration as a part of the appeals process. The allowance of an appeal is a common part of the disciplinary procedures at YHC. “The cops were reasonable. All students who get in trouble on campus get an appeal, and we decided that it would be beneficial for us as students to be examples to other students rather than [for] them kick us out [of school],” said McEwen, a Spanish major from Conyers. Eventually, it was decided that the three would individually serve 70 hours of community service, pay a fine of $300 dollars each, develop a program to return any additional master keys back to YHC administration and remain under a strict disciplinary program until they graduate. In hindsight, McEwen, Gravitt and Freeman each have regrets about the incident. Needless to say, each student has come to realize the gravity of their actions. Along with hoping that the lesson is learned, Ingle noted that the school will not press charges. Ingle said, “as long as they follow their requirements it’s a done deal” in reference to their disciplinary requirements. Though the incident occurred over a month ago, the repercussions are still being felt across campus. Ingle mentioned plans for a key policy to be established in the future. “I’m planning on implementing a key policy. I understand that there are keys out there. I plan on having a key amnesty period, where there will be no repercussions for [having keys], so long as those keys are returned,” Ingle said. Ingle stressed the difficulty of determining which students have the authority to have keys and how that approval should be reached. 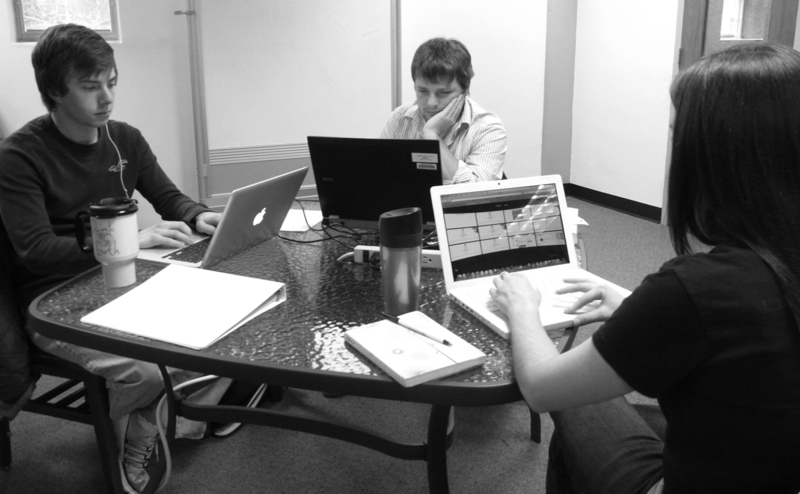 Emmanuel’s office only deals with issues involving YHC-sanctioned student organizations. Ingle believed that this issue was bigger than previously believed, but did not feel that notifying faculty about the event was an acceptable way to approach the issue. Though Ingle was surprised by the gravity of the issue, Dr. Joy Goldsmith, assistant professor of communication and department chair, commented that she was not surprised that students have access from previous years. However, Goldsmith acknowledged that students having access to confidential materials is worrisome and could become a big danger. 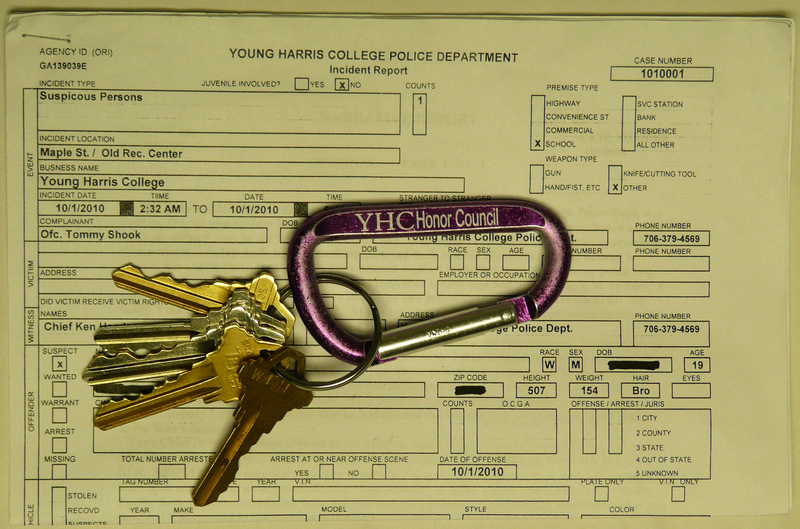 Many returning students have noticed an apparent increase in police officers on campus at Young Harris College. Students feel like the police on campus and in the surrounding counties are cracking down, resulting in more YHC students that are getting in trouble this year as compared to last year. However, the Chief of the Police Department on campus at YHC, Chief Ken Henderson, assures us that it is nothing of that sort. According to Henderson, the fact that police are more visible on campus has nothing to do with campus police having stricter standards of enforcement. “Winship always feels so safe with the cops watching our every single move,” said anonymous members of the Winship residence hall. According to Henderson, there have maybe been four or five cases of possession of alcohol by a minor on campus, or MIPs. He also stated that these MIP citations have been given, but the number is a very small amount. The campus police are putting more time and energy in the area of issuing parking tickets. As far as crime, there is not really an issue according to Henderson. The police department on campus has replaced a couple of officers who were here last year. These police officers decided to leave for other job opportunities; therefore, more officers had to be added to replace the existing officers’ positions. The campus police also needed to hire more part-time officers, because so many events have been added to campus, which called for additional coverage. Police Chief Henderson also explained that the 24-hour presence of YHC police has also contributed to the perceived increase in visibility. To help with the coverage YHC has begun a student cadet program through the campus police department. The program is designed to help the police department assist students on campus. The student police cadets are there to help the police department by patrolling the campus alongside an officer, assisting students to their destinations who come in during the late hours and by driving students to class on the police department’s golf cart. Some of the students that choose to be a part of the cadet program may have an interest in law enforcement or the study of law, though this is not always the case. According to Police Chief Henderson, the cadet program is a great opportunity for the students involved to see what law enforcement is really about. When asked about how increased police coverage on campus has affected student life, the Office of Student Development did not return comments.